It’s strawberries and cream time again and finally the sun has made an appearance this Summer, just in time for Wimbledon 2012 (“Come on Tim… I mean Andy”). If you’ve been following our blog for some time, you will know we are pretty big sports fans in the SelectSpecs Towers. We’ve even made a few train trips to SW19 ourselves to catch a bit of the tennis in person. Obviously we’ll be supporting all our British hopefuls, although sadly, just like the football last night a few have already fallen by the wayside 🙁 Hopefully Heather Watson should do well later today in her first round match, and of course Andy Murray will be playing tomorrow – but he has been given a tough draw this year. 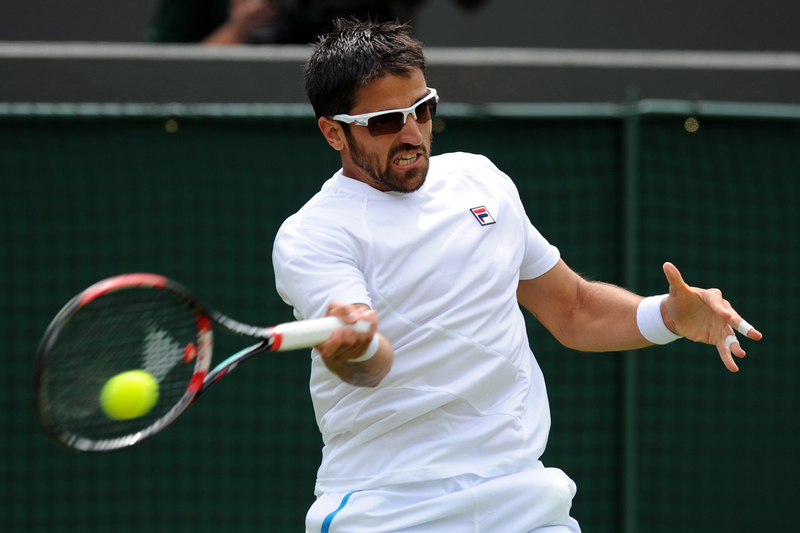 Janko Tipsarevic is another player we’ll be watching closely this year. The number 8 seed from Serbia is one of only a handful of players who regularly play in sunglasses. See what we did there? 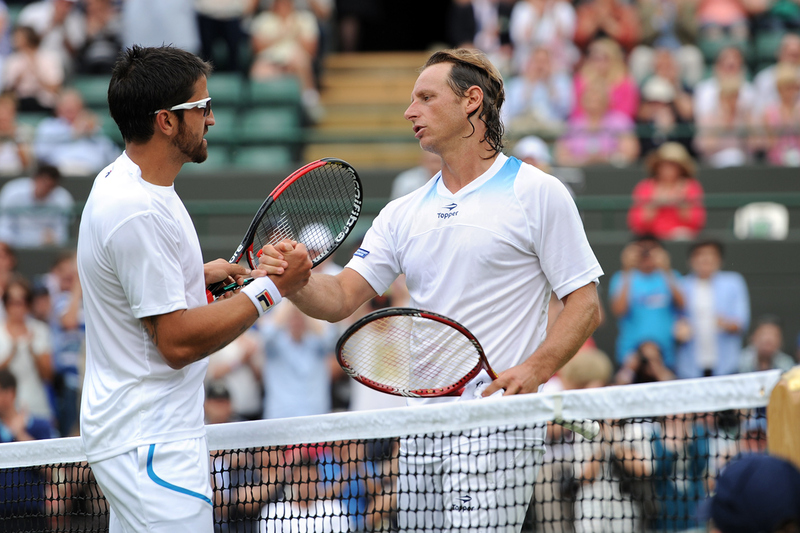 Tipsarevic has already completed his first round match beating David Nalbandian in straight sets while wearing his trademark Oakley sunglasses. Nalbandian of course recently got himself disqualified from the Aegon Championships Final against Marin Cilic when he kicked an advertising board and injured a line judge. The sunglasses worn by Janko Tipsarevic on court today were these Oakley Fast Jacket XL sunglasses (with the slightly larger lenses) in colour option 915610 – Polished White with Photochromic lenses, ideal for the changing conditions out on court. The Fast Jacket is Oakley’s top of the line sport performance sunglasses designed for elite athletes. The frame features Oakley’s famous Switchlock technology allowing you to easily switch out the lenses at a moment’s notice should the conditions change. Just in case you missed it, here is THAT incident. Chris is the Web Content Manager for SelectSpecs.com and usually blogs about new product releases, celebrity eyewear or the latest movie releases. He also runs the Sport Glasses and Movie Glasses sites as well as his own personal Movie Blog just for fun. What Oakley glasses does Tipsaravich wear when playing indoors or under lights? Some of his lenses look clear. Are these because they have an anti glare surface? The glasses Tipsaravich has been wearing look most like the Oakley OX3142 Tumbleweed 0.5 in Polished Black. 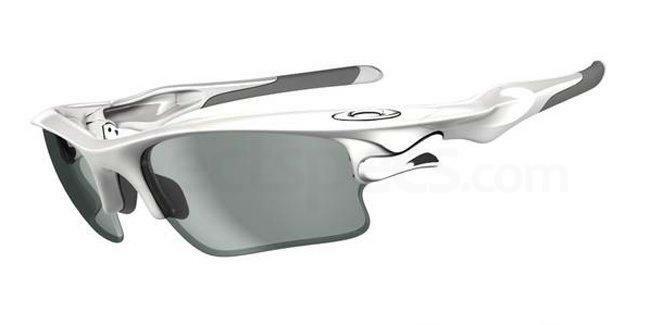 However they also look a lot like the Infinity GM 229 in Black, as I can’t see an Oakley logo in the images I’ve found. Do you have a specific image in mind we could try matching if these aren’t what you’re looking for? As for the lenses, we think it is likely as he needs prescription lenses and for added eye protection on court. An anti-glare coating would also be helpful so it is likely he uses this with a stronger lens material such as Trivex, Polycarbonate or Oakley True Digital lenses. I hope this helps, please let me know if there’s anything else!